Sharing lots of different kinds, or genres, of books with your child exposes him to different words, different kinds of images, and whole new worlds. This tip sheet suggests some genres to try with your young reader that complement 'traditional' fiction. 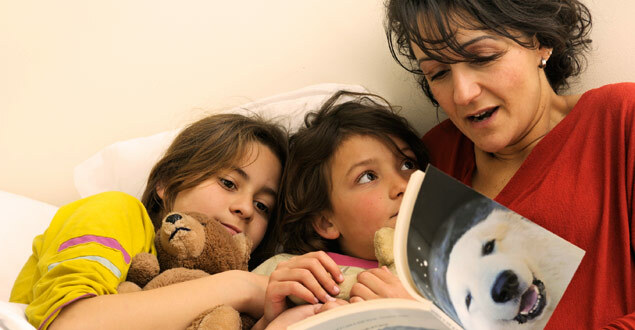 Some are suggestions for read alouds, while others may be ones your child can read on his own. It's easy to find yourself lugging home a stack of library books that your kids will love to listen to. It's harder to make sure you're bringing home a wide variety of books. But that may be just as important. Sharing lots of different kinds, or genres, of books with your young reader exposes him to different words, different pictures, and whole new worlds. Below are some genres to try with your reader that complement 'traditional' fiction. Some are suggestions that can be used as read alouds, others may be ones your child can read. From talking dogs to imaginary underground worlds, fantasy books contain elements that are not possible in real life. Cornelia Funke, J. K. Rowling and Lemony Snicket are all authors to consider within the fantasy genre. Well written historical fiction helps past events come alive for children. With topics as wide ranging as pioneer life and ancient civilizations, books within this genre awaken the historian in any child. Biographies have a way of inspiring kids. The best ones introduce famous presidents, inventors, educators and scientists in a way that helps kids identify with the person. David Adler has a series of biographies that are well loved by early elementary students. What makes a volcano erupt? How tall is the tallest man? Where does the word pumpkin come from? Kids ask many questions, and reference books help them find the answers. When choosing reference books for your child, make sure they were recently written and seem to contain accurate information. Poetry just isn't as widely read as it should be. Several children's poets have collections that will make your child howl with laughter. Poetry is often shorter too, which makes the task of reading less overwhelming for new or reluctant readers. Jack Prelutsky and Shel Silverstein are great authors to start with in this genre. Whatever you choose to read with your child, make it an enjoyable experience. Have fun visiting that magical place, getting to know that famous person, finding the answers to questions, and reading with the rhythm of poetry. For more specific titles, visit the Recommended Books for Kids section on Reading Rockets with booklists arranged by theme.